I love being a dad. It can be hard and frustrating at times. I will lose my temper or run out of patience. I can react without just cause handing out punishments that are maybe too harsh for the transgression committed. There are times when I don't give my children their chance to voice their case as I'm done with hearing anymore ... from anyone. In a nutshell, I sin. "It's been a long day"
"It's their fault. They just don't stop"
And, sometimes these are true statements. But the real truth of the matter is sometimes it's simply me giving in to the struggle with my own weakness and giving myself permission to act as I probably shouldn't. I know this in my heart of hearts...if I allow myself the time to reflect on myself and my actions. That is hard. No one really likes to hold up the mirror to themselves to see their 'ugliness' but it is essential to continue to grow as a person. As a dad. Aquinas tells us that grace perfects nature. This truth has become more clear every year. That this perfection of my nature is essential to not only my person as a child of God but also in the daily duties of my vocation as a father and a husband. — Thomas Aquinas, Summa Theologica, Part 1, Question 1, Article 8, Response to Objection 2. We are all called to holiness. This is easier said than done. Especially if you are the dad penning this post. I'll be the first to admit that it is easy to give myself a pass simply because I'm a dad. A dad with 6 kids. A dad with 6 kids who is not monetarily rich by any stretch of the imagination. Easy to give myself a pass because (fill in the blank). The last few weeks have been a real period of introspection and, simply put, grace. A grace that has allowed me to see my own 'ugliness' and the grace to overcome some of it. One of the best analogies I've heard regarding sin and its effect on our soul is that our soul can be likened to a vessel and grace likened to water. Now, sins effect on the soul is like a crack in the vessel. The larger the sin the larger the crack and as God tries to fill our soul with grace it it too damaged to hold that grace. In essence, the vessel has lost its ability to fulfill its nature. Confession returns the vessel to a state without cracks and therefore can be filled again. 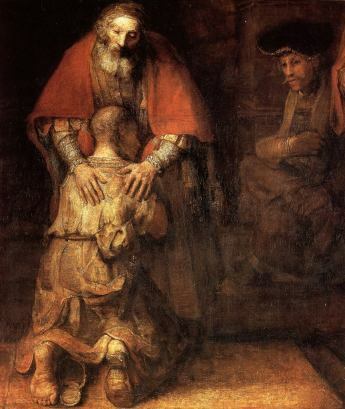 One of my absolute favorite parables in the bible is 'The Prodigal Son'. It's a story that has always resonated with me since I was a young boy. Just last year Jenn and I attended a First Communion workshop with Dominic as part of his preparation. During one of the 'sharing' times I found myself recounting the story to him and not being able to hold back the tears as I got to the point where the father runs out to his son to embrace him and welcome him home. The father runs! One other thing that is not plainly stated but can be inferred by the phrase 'at a distance'...the father was always looking for him. Hoping for his return. Always looking out onto the horizon waiting for the day that his son would return. And with the return comes the embrace. The acceptance back into the family. The kiss. A sign of the forgiveness and love poured out by the father. In my own life I've always been like the son. Though sorry for my transgressions, my entry into the confessional has been more formulaic than anything else. There's a ritual to the sacrament and it is easy for me to come up with a way of confessing my sin using a sentence structure that 'softens the blow'. It confesses the sin but allows me to save face - something that is basically the opposite of confession. It is valid - and even heartfelt - though almost medical in its style of reporting the sin. A reservedness. I will share that I typically choke up during the Act of Contrition so there is contrition but that is still after a guarded confession. All that changed a couple of weeks ago during my last confession. Something in me was tired of giving in to the weakness of my will. I entered into confession with a sense of abandonment. I was sorry, as all other times before, but this time I longed for a Father more than just the forgiveness. I longed for the person and not for just what that person could do. I confessed like no other time before. There was no selection of just the right phrase or turn of words. It was just a son saying 'I'm sorry and I need - truly need - your grace and though I am not worthy I still long for that love and compassion...a father that will run out to greet his son back into his arms'. I have two younger sons who are quick tempered and will lash out either verbally or physically depending on the situation. This is something that is common among boys and I understand this. What I do not tolerate is when they lash out at their mother. They both know this. One night a week or so ago one of them had lost his temper and made the unfortunate decision to take it out on his mother. I was not home at the time and therefore was not there to reprimand him. When I came home I found him sitting in one of our chairs just looking sad. After saying goodnight to everyone who already were in bed and Jenn explaining to me what had happened I walked back out to him to reprimand him. As I walked towards him I could see in his eyes and in his face that he was remorseful. Truly sorry. In that moment I knew that he didn't need me to tell him what he did was wrong. He knew that. What he did need was forgiveness. I picked him up in my arms and sat down with him in my lap and just held him. Embraced him. Kissed him. As the tears ran down his cheek and I could feel the tension in his body melt away I whispered to him, "it's ok. I love you" and we just sat there. Together. You see all these years my perspective has been that of the prodigal son but within that moment with my son I was given the grace to feel the mercy and love of the Father for his children and in that grace to be a better dad. Grace does perfect nature. Posted in Faith, Family Life, Fatherhood and tagged with Faith, Family, Forgiveness, Fatherhood, Confession, Prodigal, Dad, Son. May 1, 2013 by Delano Mireles.